John Calvin wrote a popular systematic presentation of Christian doctrine and life, The Institutes, in 1536, final edition in 1559. Fortean Picture Library. Following the Protestant Reformation biblical studies took a dramatic turn. By the seventeenth century the Reformed tradition determined what would thereafter be its orthodoxy. 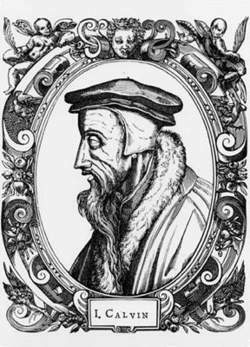 The reformer who most influenced this position was John Calvin. One of the points of Calvin's theology concerned the doctrine of predestination. Calvin was convinced that human beings were totally depraved. There is no good in a person at all, not even enough to want to be saved from sin. That doesn't mean people always do bad things. There is, after all, God's Common Grace at work in the world, available to all. But in terms of salvation and being "godlike," the human race is without hope. So how could a sinful human being choose to accept God's saving grace? The answer was to be found in Romans 8:29: "For those God foreknew He also predestined to be conformed to the likeness of his Son... and those He predestined He also called." Calvin believed the choice for salvation was not a human choice but rather a divine one. From before the time of Creation, God predestined some to be saved. Calvin never went so far as to say that some were then predestined for hell, but that was the obvious conclusion most people drew. There were those who drew back from the idea that a good God would create people who had no hope for salvation. One of these was a distinguished Dutch pastor and professor named Jacobus Arminius. Although his training had been thoroughly Calvinistic and had even taken place under the direction of Calvin's successor, when called upon to refute a scholar who rejected this aspect of reformed theology, Arminius came to the reluctant conclusion that he couldn't do it. He still believed in predestination, but he came to understand that God predestined those who, based on God's foreknowledge, would have chosen salvation if they could. Of course, their depravity made such a choice impossible, so God had to step in and intervene. Here the plot thickens, because this belief opened doors long thought closed forever. Way back in the sixth century, some of the most important works written by Augustine, the favorite theologian of the reformers, were published to oppose the views of Pelagius, a British monk, who believed humans had free will either to accept or oppose God. Pelagius had completely rejected original sin and the corruption of human nature that forces us to sin. This battle between Augustinians and Pelagians lasted seven years and was known as the Pelagian Controversy. The Pelagians were decreed heretical, and once the Church settles something it is reluctant to open the issue again. Now along came the Arminians who, while distancing themselves from Pelagianism by insisting that it was only by the foreknowledge of God that people could do good, seemed to be skirting near the same, heretical ground. T = Total depravity. Although a vestige of natural light remains within fallen humanity, human nature is so corrupt that the light cannot be used. U = Unconditional election. The election of the saved is based not on God's foreknowledge of human response but only on the inscrutable will of God. L = Limited atonement. Christ did not die for all humanity, but only for the elect, meaning those who are saved. I = Irresistible grace. God's grace cannot be refused, for it is greater than human sin. P = Perseverance of the saints. The elect cannot fall from grace, or choose not to be saved. Those who accepted these five points, later amplified and detailed at the same Westminster Assembly that affirmed the Westminster Confession and the teaching device known as the Westminster Catechism used by many churches to this day, became known as Calvinists. Their descendants formed denominations we now know as Presbyterians, Reformed, and Congregationalists. Those who rejected these points formed denominations represented by groups such as the Methodists and Baptist denominations of today. It is important to understand that these people were not simply playing mind games and performing academic exercises. History was changed by what they decided. Lives were lost and wars fought. For example, when the Puritans landed on the shores of New England, they were staunch Calvinists. They had come to believe that, although good works could not earn salvation, actions were proof that salvation had been granted. And so the so-called Puritan ethic was born. The whole community examined an individual's life, because how a person behaved was the sign of God's work of grace. Someone once said, "Puritanism is the fear that somewhere in the world, someone might be happy." They may not have been far from the truth. Where John Calvin had found great joy and relief in the idea of resting secure in the arms of God's grace, his followers followed a strict, judgmental religion far removed from his original understanding. These were the people who persecuted unmercifully anyone who was Catholic or Quaker and publicly punished those found guilty of violating the Puritans' narrow structure of community standards. First, if God had predestined some to be saved, there must be "heathen Indians" out there somewhere who were simply waiting for correct teaching. Their Christian duty was to find them. Second, if unsaved Indians were predestined for hell, it was the duty of Christians to fulfill God's will by putting them there. Viewed in this light, King Philip's War, fought in the seventeenth century, perhaps the biggest per capita bloodbath ever fought on American soil, was a holy war between Christians and Indians. Of course it was also a political land struggle and a clash of weapon superiority, but published sermons of the time leave no doubt that the Calvinist religious component of doing God's will justified the conflict in the minds of the Europeans. Contemplating the carnage of only this one example reveals that, far from being simply academic exercises, religious doctrines and conflicts have been at the root of events that have caused real and undeniable damage.